Luckily over the past week, we’ve had some beautiful weather so we’ve spent just about every day down at the yacht club working on the boat. The first chore was to uncover her by removing the shrink wrap which is always such a fun job (NOT) especially if it is windy out. The worst part of the job is having to fold up the humongous pieces. Actually though, this year at first we just cut the shrink wrap short along the hull/deck joint so we could keep the superstructure covered (rain was in the forecast) yet still work on the hull and bottom. Full removal could wait until we are ready to work on the topsides. Now that all the strapping and shrink was out of the way, the daunting task of waxing the hull begins. Linda does most of the two coats all by herself. I only do the high parts that she can’t reach from the work platform. We usually do an initial cleaning with Nu-Brite automotive polish (orange bottle) to remove all the grunge and bring the shine back out – this is a cleaning type of polish. After it is cleaned, we then apply a coat of Collinite #885 Fleet Wax (a Practical Sailor top choice – designed for aircraft maintenance) which does a great job of protecting the finish – we use it on the coach too and it really does last all season! 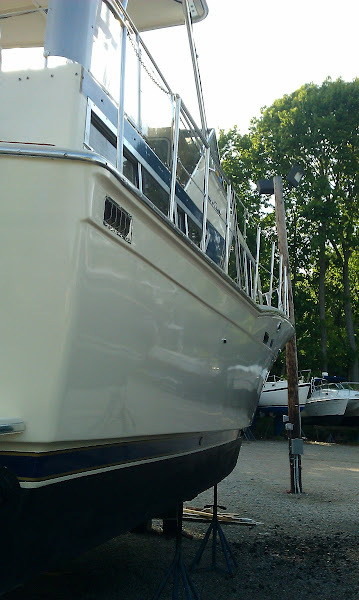 Initially hand waxing like this isn’t too bad but then as the arms start to tire it seems the boat (just like an RV) becomes a living creature and grows in length! 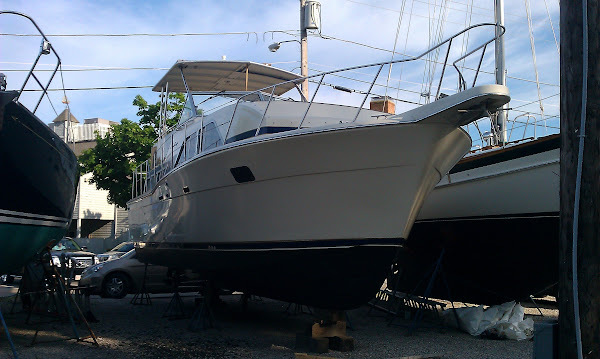 When waxing and cleaning we always say we have a 70′ boat – it’s 35′ on the starboard side and another 35′ on the port side! By the way our hull was painted sometime prior to us acquiring the boat. The paint product used is Awlgrip a well known polyurethane paint that holds up well in marine environments. Unfortunately there are some flaws in the paint job itself but these are mostly not noticeable. While I have always been a big fan of well maintained gel coat because minor blemishes are easy to fix, at this point (and taking a lesson from the RV industry), I think paint may actually be the best way to go as it requires less maintenance. 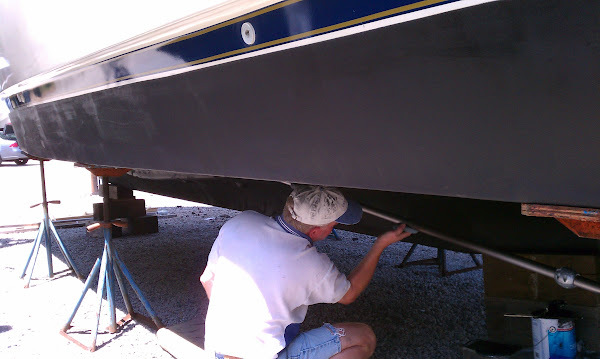 Once the waxing was done, the next day Rob masked off the water line in prep for painting the hull bottom. 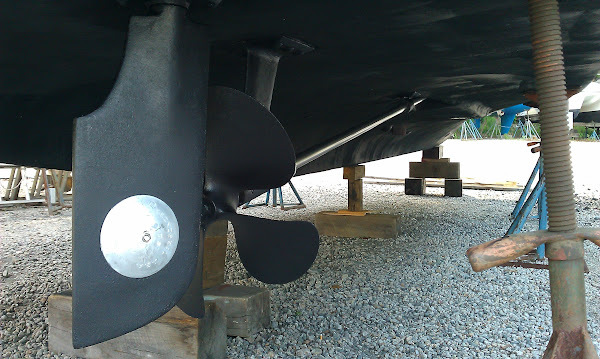 We use a multi-seasonal “ablative” anti-fouling bottom paint and this year it is not necessary to recoat the entire bottom. We are only going to paint the hull sides where they are most visible to “pretty” them up a little and add another coat to the “high wear” areas like the bow along the keel. 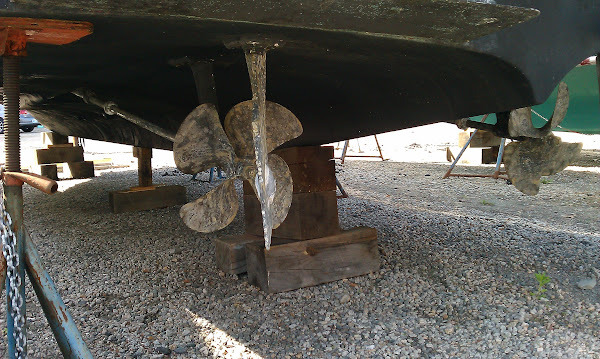 “Ablative” means the paint wears away gradually from water motion exposing fresh anti-fouling material (usually copper). Ablative paints actually get smoother with use. 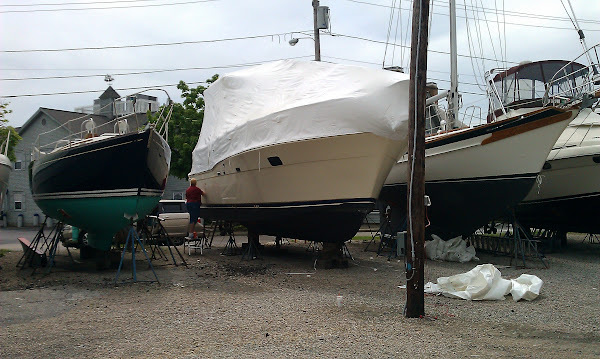 Multi-seasonal means the paint retains its antifouling properties indefinitely, even when out of the water. With standard bottom paints the copper leaches out and you are left with a thick useless film that needs to be sanded off. Sanding a boat bottom is one of the worst jobs in the world and is to be avoided at all costs. With our painting system, we NEVER sand, we only clean off any leftover slime and wipe the existing paint down with a solvent before applying the new coat. Why anyone would NOT use an ablative multi-seasonal paint is beyond me. OK it’s expensive ($180/gallon and up) but you don’t need to apply it every year – AND NO SANDING – so is actually a lot cheaper in my book. 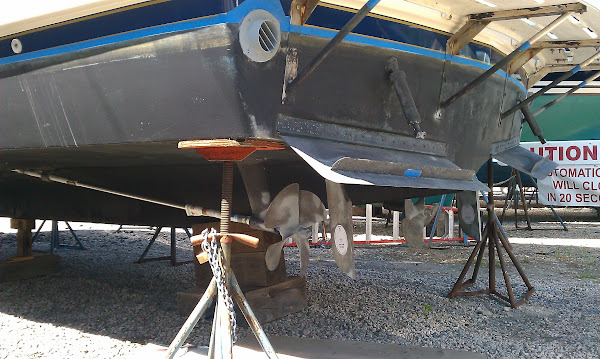 In 2008 due to problems with the paint we inherited with the boat we had the bottom “soda blasted” to remove all the old incompatible layers of paint. Soda blasting is – yes you guessed it – blasting off the old paint with baking soda. This leaves a nice matte finish in the gel coat ready to accept paint. It’s also an environmentally responsible technique as all the old paint is captured and disposed of properly. After the soda blasting Linda and I applied four layers of a “barrier coat”. 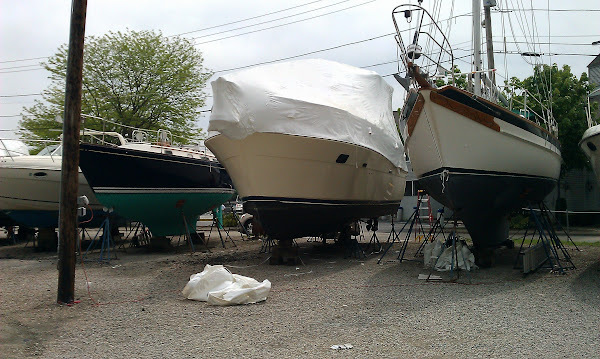 A barrier coat is more resistant to water intrusion than regular paint and even gel coat – yes water WILL permeate gel coat and this has caused problems with some (usually newer) boats in the form of “blisters” – kind of like oozing sores in the fiberglass. 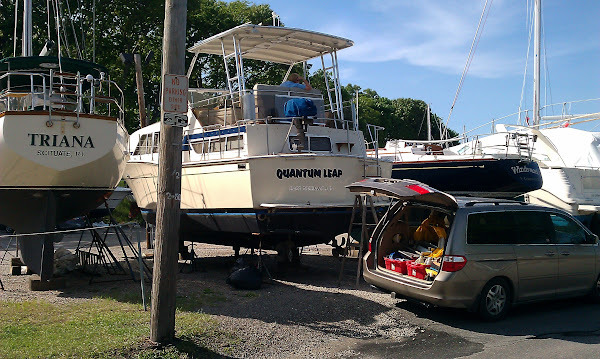 Quantum leap has never had a blister but since we went to all the trouble to get off the old bottom paint, a barrier coat seemed prudent. 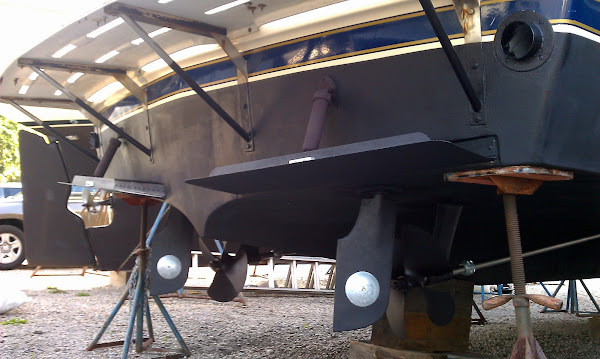 After the barrier coat we applied a layer of multi-seasonal ablative antifouling (we use Micron Extra, but there are several other choices) in red, then two more coats in black. The red is a tracer coat and will start to show thru as the black wears away indicating its time for a new coat of black. After the initial three coats of Micron we have only fully painted the bottom twice so far. By the way, with this paint while a thin layer of slime may develop over the season, the number of barnacles we typically find attached to the hull can be counted on one hand. The running gear (underwater metals) is another story! Anyway, back to 2012! Now its time to remove the rest of the shrink wrap. We folded up the straight pieces to use for drop cloths when painting the house. Then I disassembled the wood frame for the shrink, while Linda busied herself topside (that’s her being busy in the photo left), cleaning the underside of the hard top, polishing all of the metal posts and railings, cleaning the side plexiglass, and waxing the area around the enclosure snaps. Once the bridge deck enclosure is installed, it is pretty difficult cleaning the attachment areas so it is better done ahead of time. Next project is my favorite. (NOT! that’s a fake smile in the photo left). 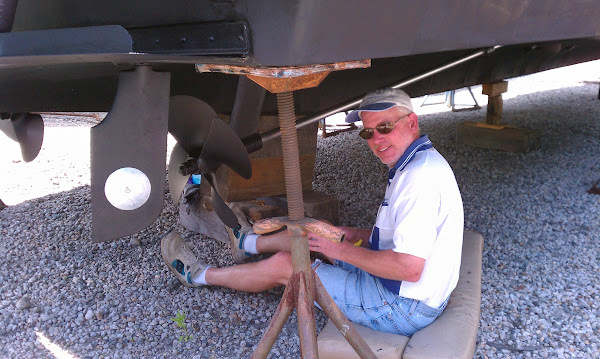 So while the boat hull never needs sanding, the running gear does and it took me most of a day to do all the prep work. For the past three years I have experimented with various systems to protect the underwater metals and minimize maintenance. Results are mixed and not a whole lot better than just leaving the metal bare, but results from last seasons attempt were partially successful. 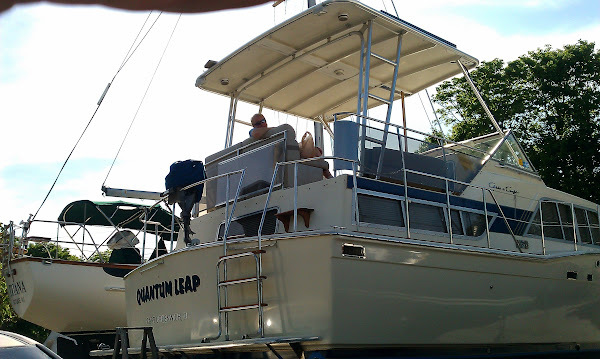 Running gear underwater metals on Quantum Leap include the trim tabs (stainless), shafts (2@11′ ea A22 stainless alloy), shaft struts (total of 4, bronze), propellers (2, bronze), rudders (2, bronze), swim platform struts (4, stainless), exhaust ports (2, stainless). My system from last season is a coat of Petit zinc barnacle paint on the cleaned bare metal with a second coat of ablative bottom paint. This combination seems to work better than either paint alone. The zinc based Pettit paint acts as a primer and perhaps helps the ablative stay stuck to the metals. Anyway, the props, trim tabs, swim platform struts and shaft struts all came out of the water last fall with the paint mostly intact. There was some moderate fouling with barnacles but the paint did not peel off when I did the final scraping and prep this spring as it had in past years. On the other hand, this system did not work very well on the shafts. The fouling was just as bad as it would be for bare metal so required some aggressive scraping which removed most of the paint layers. That meant a few extra hours bringing them back down to bare metal, so this year I decided to just leave the shafts naked and will plan to hire a diver to clean them off two or three times this season. I think the cost of the diver is probably cheaper than the time and materials for other preventative methods. Of course if we used the boat every other day or so, none of this would be a problem and the underwater metals would mostly stay clean, but that ain’t gonna happen I’m afraid. 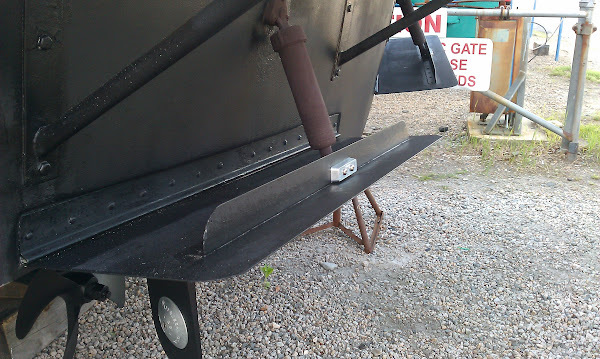 Next I painted the plastic trim tab actuators and depth transducer with Pettit water based antifouling (no solvents to harm plastic parts) and then painted the hull waterline with the Micron Extra. Now it’s time for the “fun” parts. Peeling off the masking tape, installing the zinc sacrificial anodes and sitting back to admire the pretty looking boat with fresh bottom paint and shiny zincs. Phew! So finally by Sunday, the hull waxing had been done, the waterline was freshly painted, the running gear prepped and painted, the zincs installed, and the area around the enclosure cleaned so we were good to go! But wait! For the last few years the port engine to shaft alignment seemed a bit off to me. The prop shaft was not centered where it entered the shaft log and appeared to be rubbing on one side. I had attempted alignment while in the water but apparently not to successfully. So I figured I better try again on the land where I could see what was happening under the boat. Doing this alignment involves moving the engine on her bed mounts – not an easy job, so out came a couple of gorilla sized pry bars and the giant sized wrenches and sockets to loosen up the adjustment points. After much sweating and swearing I did manage to scoot the engine an 1/8″ or so toward center and got the shaft where I wanted it in the shaft log. Next I fooled with the height font and back and got the transmission to shaft coupler within tolerance – this involved about 10 trips in and out of the boat to check for progress at the shaft log but it was finally done! So we are ready to splash, the rest of the cleaning can wait until we are in the water!